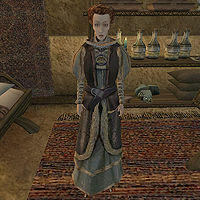 Aurane Frernis is a Breton apothecary who runs an independent alchemy shop in the western corridor on the upper level of the Lower Waistworks in Vivec's Foreign Quarter. She is a restocking vendor of the following ingredients: black anther, coda flower, corprus weepings, green lichen, hypha facia, red lichen, resin and shalk resin. Her success has not made her popular with House Hlaalu or House Telvanni. Aurane wears an expensive shirt, skirt, and shoes. Aside from her natural bonus and resistance to magicka, and her ability to shield herself for short periods, she knows the following spells: Great Resist Fire, Great Resist Common Disease, Iron Will, Wisdom, Lightning Storm, Shockbloom, Distracting Touch, and Wearying Touch. An Apothecary Slandered: Investigate the source of some inflammatory leaflets about Aurane Frernis. Roland's Tear: Find five of these rare flowers for the alchemist Aurane Frernis. "Those are secret. I will not reveal them to you." (Disposition at least 75) "I like you, %PCName, but I would never reveal my secrets." "A leaflet? What's this? This is ridiculous! It's all lies! Why...someone must pay for this. Tell you what, %PCName, if you can find out who is behind this slander, I'll reward you well. Ask whoever gave you this leaflet what's going on. This is an outrage!" "Hello again, %PCName. I need someone to fetch me the gold kanet flower that grows in the ruins nearby." "Hello %PCName! I'm still waiting for that gold kanet flower. Not to be pushy, but I don't like to be kept waiting." "The flower I need is called Roland's Tear, and it has magical powers greater than the ordinary gold kanet. It grows in the Daedric ruins near Vivec. I'd be grateful if you could go fetch five of the flowers for me. Mind you, it's one particular type. The others won't do. If you could do this little favor for me I will make you something rare and wonderful from the ingredients left over." "Yes, I must find some Roland's Tear soon." This page was last modified on 23 November 2018, at 06:04.